Gentle Giant’s newest San Diego Comic-Con 2017 exclusive is this awesome The Walking Dead Television Series Mini Bust of the evil Negan! 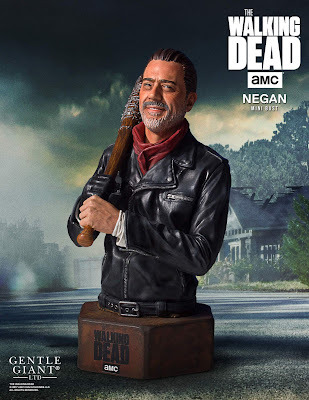 Based on Jeffrey Dean Morgan’s appearance in the hit TV show, this mini bust is series accurate down to the tip of baseball bat Lucille’s barbed wire. This is one character who knows exactly how to make an introduction, establish his rule, and widen his scope of control and dominance. Take this bust home… like a champ! The San Diego Comic-Con 2017 Exclusive The Walking Dead TV Series Negan Mini Bust is hand cast, hand painted and hand numbered with a limited edition certificate of authenticity. This 1:6 scale mini bust stands 7” tall and can be purchased at the Gentle Giant SDCC booth #3513.